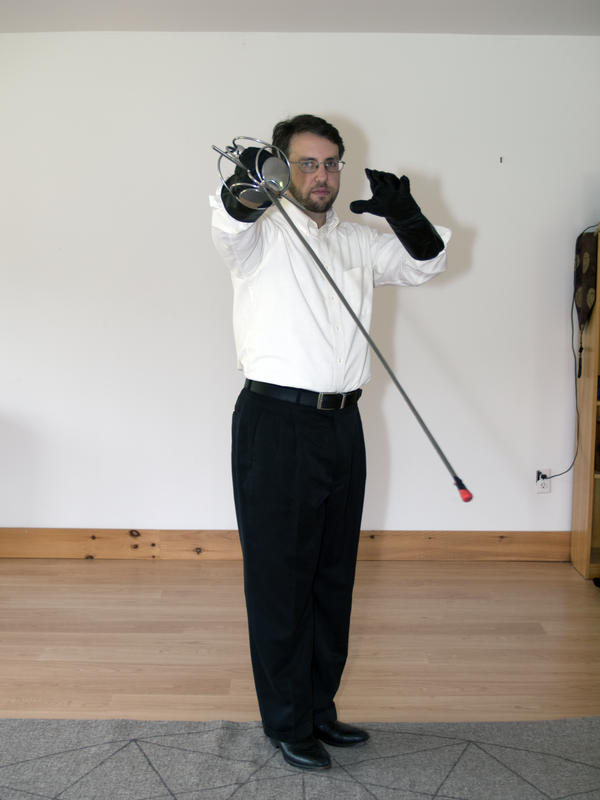 This is the fourth part of a series of posts about La Verdadera Destreza, the Spanish rapier style, as I practice it. See parts 1, 2, and 3 for the story so far. So far in the series, we’ve covered some basic principles and footwork. In this post, we’re going to talk about the “meat” of the style – the bladework. Destreza bladework is based on the same fundamentals as any rapier style: thrusts are preferable to cuts, the shortest distance is a straight line, and one should use the least movement necessary to accomplish a goal. However, the central philosophy of Destreza – stay safe until you can attack with certainty – dictates certain tactics that other arts do not use, or at least do not prioritize. 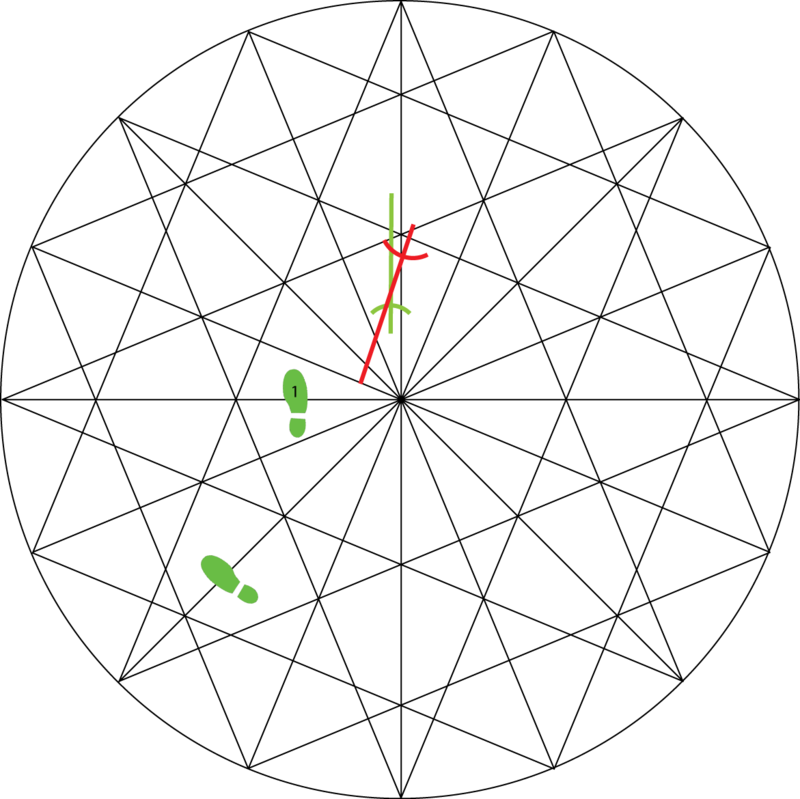 The target area is divided into four lines: high/low, and inside/outside. The point of division is at the hilt of the sword: “high” is above the sword, “low” is below it, “inside” is to the left for a right-handed swordsman, and “outside” is to the right similarly. If I, a right-handed swordsman, hold my sword out to my right side, there is no target available in my outside line – the outside line is “closed”. Conversely, the inside line is “open” – a straight attack in this line can hit me. We’re going to look at defenses first, because that’s how Destreza thinks. In general, any time a diestro is attacked, he would like to have two (or more) separate defenses, either of which would defeat the attack. This is part of Destreza’s one-step-ahead approach to combat. One of these defenses is normally to move off the line of the attack, as described in the footwork section of this series, and the other is a blade movement to prevent the attacking blade from making contact. There are two ways to do this: one can simply close the line of attack, or one can physically move the attacking blade away from the target area. The latter is known as “opposing” the blade; the technique is one with “opposition”. 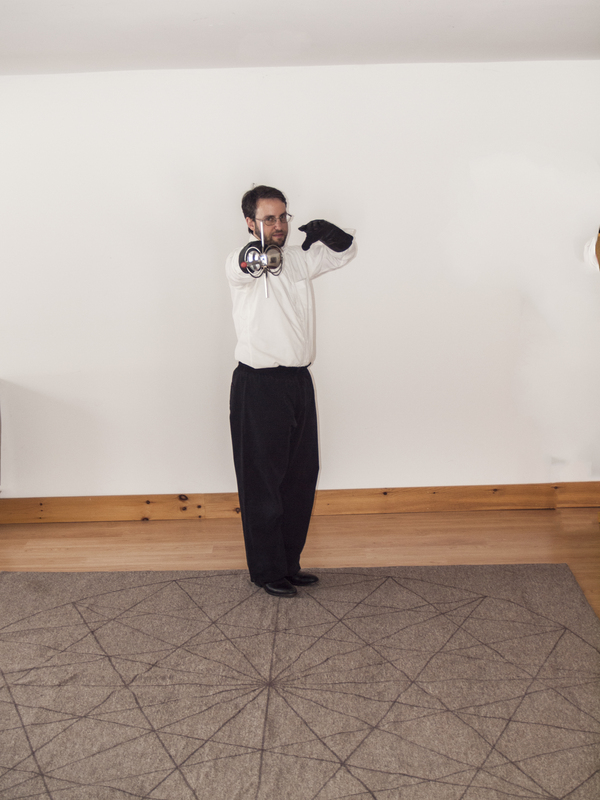 An alternate defense for the same attack would be to take a right transverse step, turning the body to align the blade onto the right-hand oblique line of the circle. This is a technique with opposition – we are dragging the attacking blade off the line that it was intended to follow, and forcing it into our new low-outside line, which we are simultaneously closing. 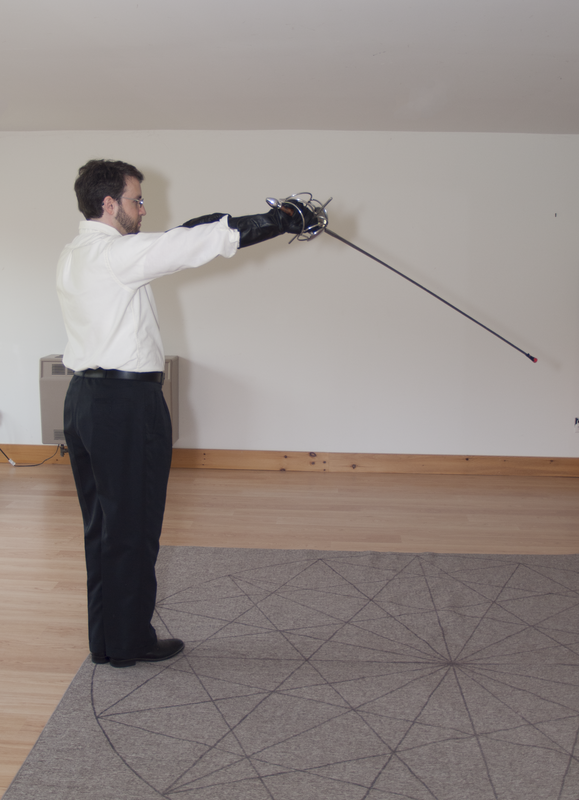 This has the disadvantage of providing much more tactile input to the attacker (that is, he can feel his blade being moved), so he may respond more quickly. It also potentially drags the attacking point across our own body; if the attack is quick enough, we could conceivably be hit. Note that in neither of these cases are we “parrying” as such. In fact, we haven’t done any actual bladework at all – our sword has remained in guard the entire time. Everything has been done through footwork alone. Once the defender’s body is off the line of the attack, parrying is frequently unnecessary, and often actually counterproductive – in order to parry an attack that is not actually aimed at the spot where I’m now standing, I have to take my blade farther away from the shortest line between me and my attacker. If I can accomplish my goal with footwork, I can use my blade movements for counterattacking. The exception to this rule is when defending against cuts. Since cuts sweep through an arc, they are much more difficult to evade than are thrusts; you can’t simply move off the line of the attack. Therefore, cuts must be parried, but we do this with the smallest motion that will accomplish the goal, and without opening ourselves to further attacks any more than necessary. Parries in Destreza are generally performed by placing the point of the sword onto the center line (the line that joins me and my attacker), and the hilt of the sword at one of the four corners – in front of a shoulder or a hip. If the hilt is at shoulder level, the point is at hip level, and vice versa. This guarantees that the body is always covered, and the point is always in position to perform a direct thrust to the attacker’s center line. 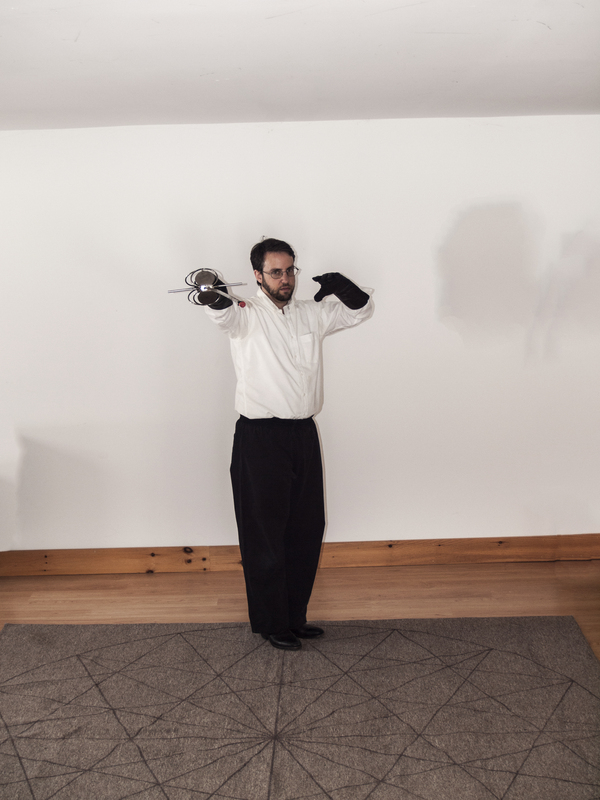 By extending the sword forward (as usual in Destreza, we perform parries with an extended arm), we force even head-height cuts to strike the parry at a point that is strong enough to stop them. Note that we don’t have to completely stop the cut – we just have to take enough of its power to prevent it from doing damage. Of course, a full-arm swing would crash through these parries, but unless I’m already seriously out of position (in which case I’m not going to manage a good parry anyway), if the attacker pulls his arm back to do that he’s not going to survive to finish the attack. Rapier fighters always prefer thrusts to cuts – they are faster, more direct (that is, they don’t open you up as much), and do more damage for less effort. Destreza is no exception to this, but we do use cuts more than most rapier styles because we often find ourselves at an angle such that it’s more convenient to cut than thrust. That said, cuts are usually not lethal enough to be a finishing move, so we’ll normally consider a cut as creating an opening for a followup thrust. Since we normally fence with arms extended, thrusts are primarily done by body movement – either a simple rotation of the body, or a step towards the target. Body angle is critical – by maintaining approximately a 45 to 60-degree angle between the shoulders and the line of the diameter (with sword side forward), one can maximize one’s reach. If the opponent’s body is not similarly angled, it’s possible to outreach him by simply striking in a straight line without exposing oneself to a counterattack to the body. Cuts are more interesting than thrusts. 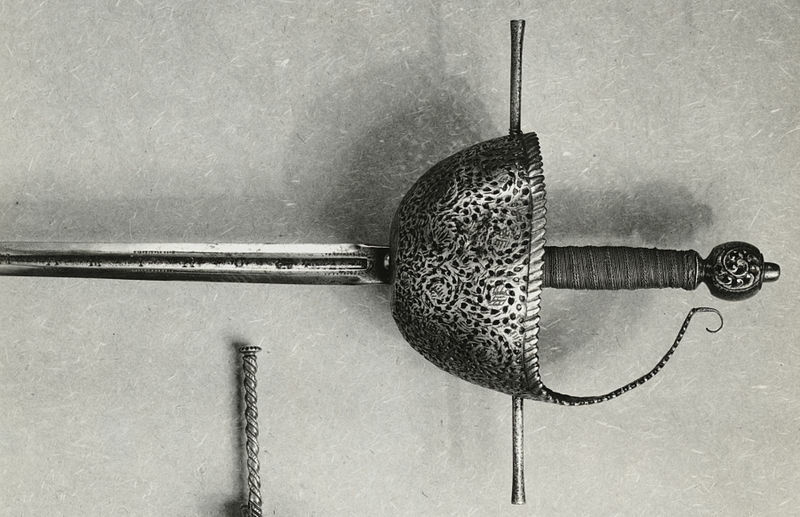 Rapiers do not cut well; the blade is too light to strike with power and too narrow to take a good edge (the bevel is too short, meaning that the angle of the edge is larger than it ought to be for optimal cutting). The idea is to swing the rapier through an angle and strike as close to the point as possible – since the pivot point is at the hand, closer to the point means that the blade will be moving more quickly and thus will deliver more power. These are impact cuts – some people (in particular, SCA fencers) tend to think of draw cuts, but those really don’t work with rapiers. There are two types of cuts, which I refer to as full-circle cuts and snap cuts. 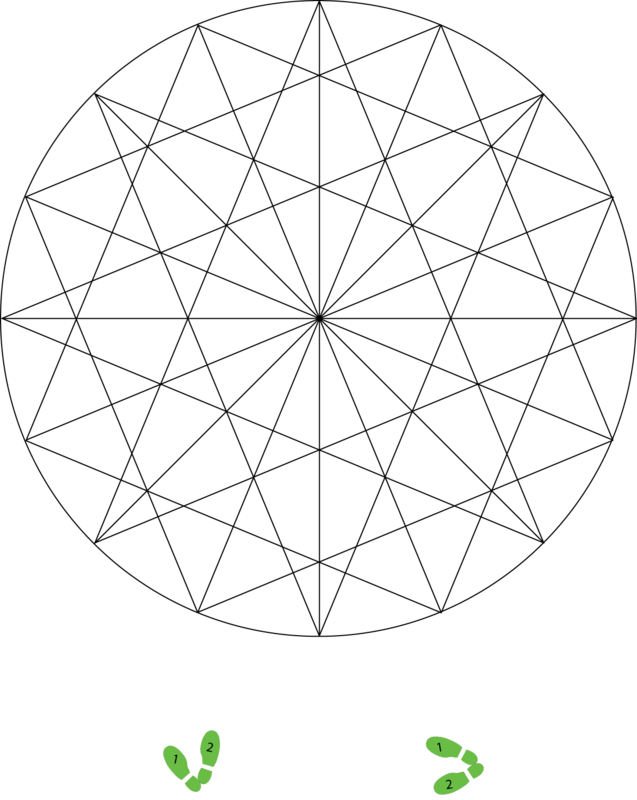 Full-circle cuts (a bit of a misnomer, since they don’t necessarily cover a full circle) are the ones that people do naturally, and they’re the ones described in the historical literature. To execute a full-circle cut, the diestro spins the sword through an arc using his wrist, elbow, or occasionally shoulder as the pivot point. Full-circle cuts have tremendous power, and the larger the joint used, the greater the power. While no rapier cut will cut a neck, a full-circle cut from the shoulder could conceivably sever a wrist if it struck just right. Unfortunately, full-circle cuts are extremely slow, and leave the swordsman completely open during their execution. Generally, we use them only when we’re sure that the opponent can’t counterattack, such as during a Movement of Conclusion (to be discussed in a future post, but the point is that you’ve got control of the opponent’s sword while executing the cut). There is another problem, as well – if a full-circle cut misses or is deflected, it can overshoot the target, leaving the diestro open. Both of these issues are addressed by snap cuts, at the expense of some of the power of the cut. To execute a snap cut, the diestro places his hilt on the line between himself and the target, and his point slightly (maybe 20-30 degrees) off that line. He then snaps the hip on his sword side (the right hip for a right-handed swordsman) forward, allowing the power generated to throw his hand forward. The momentum of the sword blade snaps it out straight, making contact with the target. Snap cuts have two great advantages over full-circle cuts: they don’t require that the sword be removed from a defensive position at any point, and they can’t accidentally swing beyond the target. Of course, they do lose a great deal of power, but with practice they can hit quite hard, and since the cut is used primarily to create an opening for a thrust, it’s not necessary that the cut do tremendous damage on its own. One can add power to a snap cut by retracting the arm from the elbow or the elbow and shoulder both prior to executing the cut; this gives more room for the cut to accelerate, and allows the swordsman to add the power of his arm muscles to the cut. Of course, doing this sacrifices some of the speed of the cut, and creates a (small) opening for the opponent to exploit while the sword is withdrawn. The term atajo is somewhat unique to Destreza, and coming up with a good translation into English is not easy. It means something like “control of the blade via engagement”; it is similar to the French pris a fer, but that phrase refers to a specific offensive technique, whereas atajo is more general. In the historical literature, it appears that atajo refers to a specific blade position: the diestro takes engagement from above his opponent’s blade, with his blade at an angle on the horizontal plane (that is, the diestro‘s blade points to the left or right of the opponent’s). The usage of this term that I was taught is more general, and I don’t know whether this is a consequence of having it interpreted by an English-speaker or whether the meaning has just mutated slightly over the past few centuries. As I was taught, any time you have engagement – contact with the opponent’s blade – you have atajo. You use your sensitivity (in Spanish, tacto) to determine the opponent’s intent, and then you use your knowledge of geometry and leverage to place your blade in a position so as to control the opponent’s blade. That said, engagement from above is still the strongest position, so it’s the preferred position for atajo when you can get it. Any time you have moved off the diameter of the circle and the opponent’s blade has not yet followed you, you have an opportunity to cross their sword. From the hanging guard, given an attack in the low line, this is most easily accomplished by taking a lateral or transverse step to the right, dropping your hilt so that it is level with or below the attacker’s blade (below is preferable for defense, but that requires additional movement, so it depends on the precise situation) and allowing your blade to simply drop onto the attack. From this position, you have a great deal of control over the attacker’s blade. You can, for example, attack with a straight thrust down the diameter, relying on your atajo to prevent the opponent from parrying towards you. Alternatively, you can take a left transverse step and attack with opposition, pressing the opponent’s blade to your inside line and attacking to his inside line. Of course, the possible permutations of bladework are endless. The examples given in this post are very simple – most exchanges involve multiple compound blade movements on both offense and defense, but these are too complex to easily describe in a format such as this. Next time, we’ll look at the hanging guard and the right-angle guard and the implications of using one or the other. 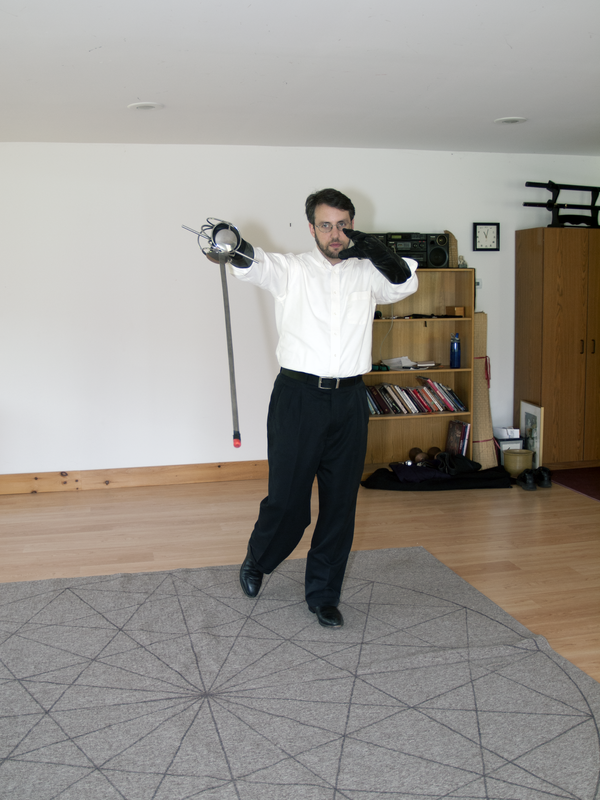 This is the second part of a series of posts about La Verdadera Destreza, the Spanish rapier style, as I practice it. See part 1 in the series for some background. One of the central, and most misunderstood, features of Destreza is the “Spanish circle”. It looks complicated and mysterious, and in the sixteenth and seventeenth centuries many people would have considered it magical. 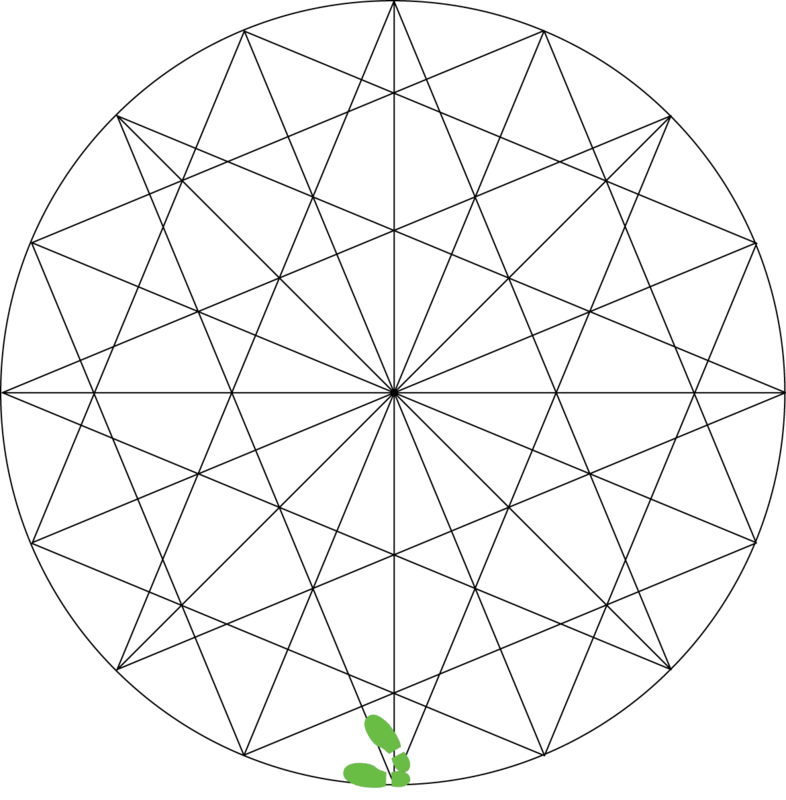 All of this contributed to Destreza’s reputation as being abstruse and academic, but in fact the circle is a very practical training tool. It is simply a diagram, drawn out on the ground, of various possible movements, attacks, and defenses that one might execute. The first thing you must understand about the circle is that it exists in the mind of the fencer. One does not fight in the circle, that would be ridiculous. One trains in the circle, until the dimensions and angles of the circle are engraved indelibly in the mind and muscles of the fencer, and one no longer needs to think in order to step out at the right angle and strike at the proper distance. Being a construct in the fencer’s mind, the circle can move whenever it is convenient for it to do so. In practice, it is usually convenient to think of the circle as remaining stationary during an exchange, and resetting whenever there is a pause in the action or the fencers return to guard. 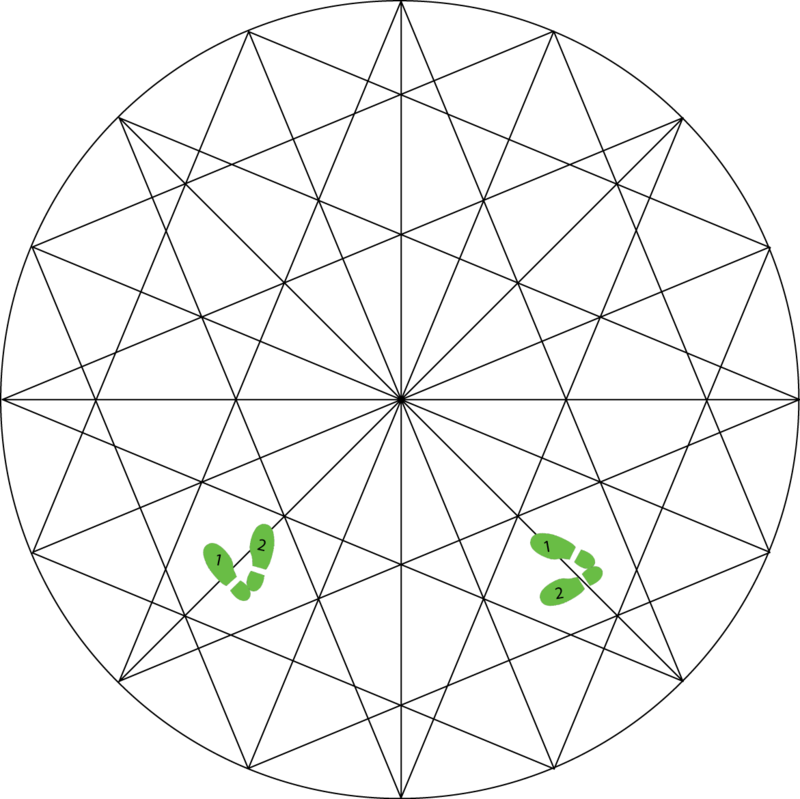 One therefore starts at one end of the circle, and (potentially) walks across the circle during the action, and returns to one’s starting point (by resetting the circle) whenever it is convenient to do so. The second thing you must understand about the circle is that it is specific to a given fencer. In my school, the diameter of the circle is defined to be one step plus an extended arm. This means that it depends upon the fencer’s height and build, and also upon the length of their sword. A longer sword results in a larger circle, which requires longer steps; thus, it is important that the sword length be well-matched to the fencer’s height and style of movement. 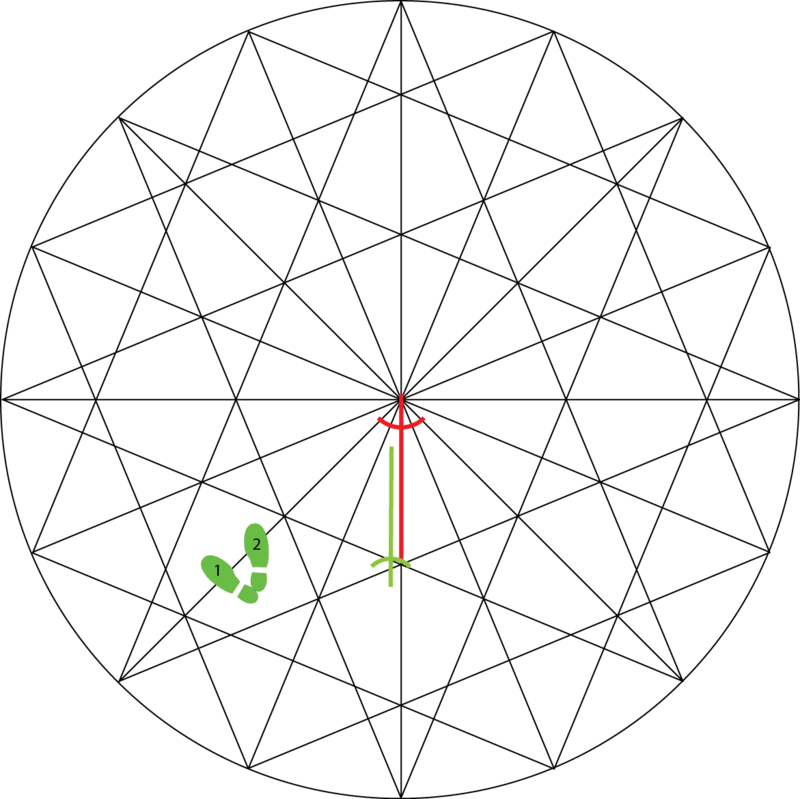 The diestro stands at one of the cardinal points on the circle, by convention at the bottom when the circle is illustrated in this way. His opponent stands directly opposite on the circle, at the top, with the vertical diameter line joining them. 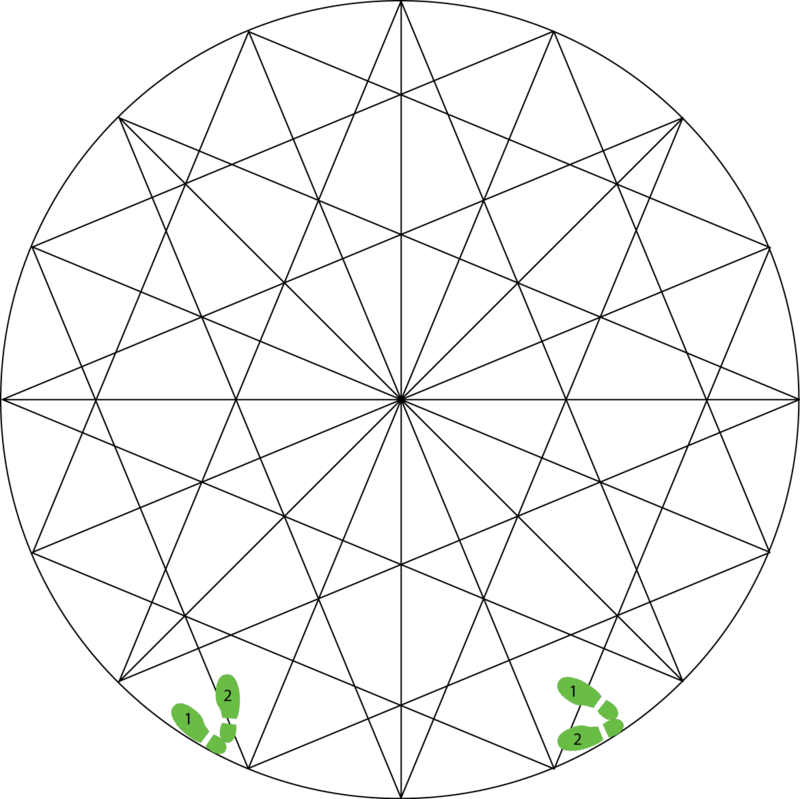 This line, the line of engagement, is commonly referred to as “the diameter”, despite being one of eight diameter lines on the circle. Note that the diestro in this example is in a “hanging guard” – that is, he is standing with his point in front of his left hip and his hilt in front of his left shoulder, with the sword angled out towards the opponent. This is a compromise between the historical “right angle guard” (with the sword pointing straight out from the shoulder) and an angled guard such as the French or Italian guards. It provides a greater defense without losing too much of the reach advantage of the right angle guard. With a short step along the oblique to point F, the diestro then drives his sword in along the diameter. This is a very difficult attack to defend against, first because it starts so close, but also because even if it is successfully parried, it is very easy for the diestro to angle his sword out to the left and strike around the parry. There are a few things to note about this technique. First, at no time was the diestro in any danger of being struck. When the attack came in, he performed a double defense – leaving the line, and interposing his sword. Either of these would have sufficed to defend against the attack. If the attacker was able to counter the diestro‘s attack successfully, the diestro could always retreat back along the line of the oblique without ever being exposed to an attack. 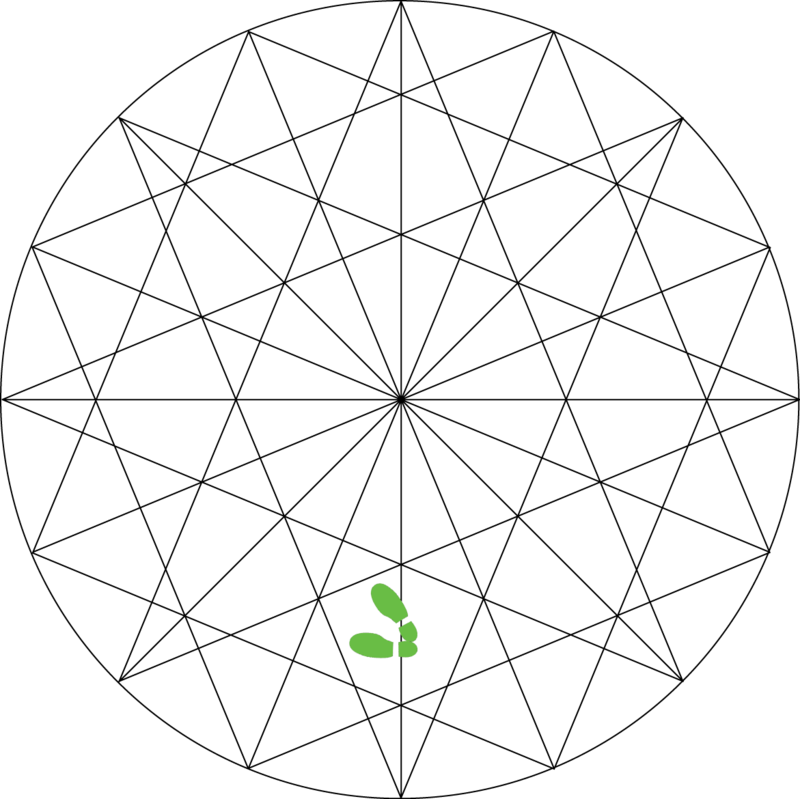 Second, note the use of the circle to shape the technique. By training on the circle, the diestro has learned that by stepping to point B, he can remove himself from the line of the attack, close the line, and simultaneously set up a counterattack, all with a minimum of motion. The circle also tells him the range at which he can respond to the original attack, and the range of his counter. Next time, we’ll codify the footwork, and look at range issues.